This species is fairly new to the UK and so far only recorded at two sites, originally in East Kent in 2004 and in East Sussex in 2013. The first record was from Samphire Hoe, a site created by the deposition of 5 million cubic metres of chalk marl (excavated from the channel tunnel) at the edge of the sea at the foot of high chalk cliffs just west of Dover. N. maculatus adults and nymphs were found in freshwater pools, with fluctuating water levels, among Myriophyllum, Chara and Potamogeton crispus. The water depth was about 0.5 m and the site was about 150m from the sea (Nau & Brooke, 2005). The second record was from Jury’s Gut Sewer, at Rosedale on Romney marsh, close to the coast near the Kent border. Here the water was brackish and associated species included Gammarus zaddachi, Neomysis integer and Palamonetes varians. 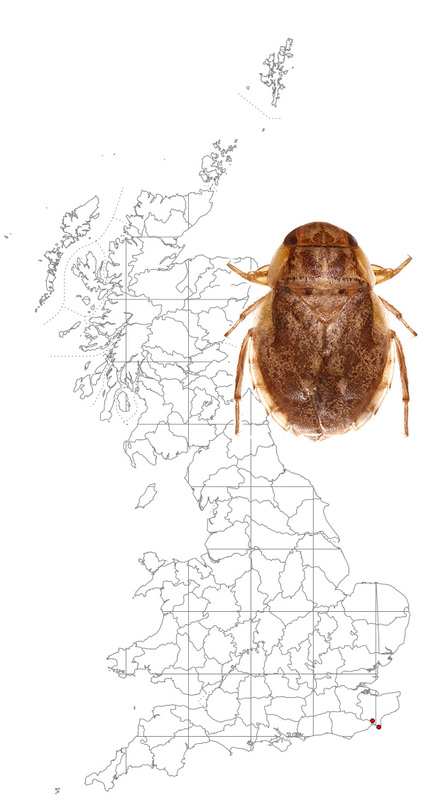 The map shows the only two records for Naucoris maculatus. It has not been recorded Ireland. Naucoris maculatus can be distinguished from the similar Ilyocoris cimicoides by size (about 9.8-10.4 mm in length as opposed to about 12.0-15.0 mm), the pattern of dark marks on the pronotum and a rounder outline to the hind body. Nau,B.S & Brooke, S.E. (2005) Ent. Mon. Mag., 141, 193-196.